When you have spent a few years researching and practicing Agile software development you tend to not be surprised by new developments. I know I wasn’t… until I saw Joe Justice at #ALE13. Joe is working on a project to build a car that will disrupt the automotive industry. You don’t believe me? Well, what if I told you that they are building a car that costs (with profit) USD25000, has a 5-star equivalent rating and achieves 1.25ltr/100km (or 100 MPG)? Still don’t believe me? What if this car could have any part changed as quickly as you change a tyre on a normal car? Yes, even changing the engine is that quick!! All about this car is revolutionary, but the most revolutionary part in this project is how they are building the car. Joe presented Xtreme Manufacturing as a method that puts together what we have learned in the software industry through Extreme Programming, Scrum, Test Driven Development and other methods. You see, the thing that will be the most disrupted by Joe’s work is how cars are built. Cars are built in Billion Dollar/Euro factories. Every time some part changes it costs millions to change the machinery necessary to produce that part. Not in Joe’s project – Wikispeed! 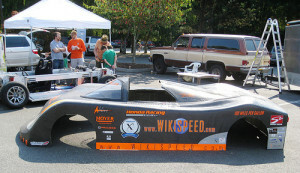 The Wikispeed car has a carbon fiber body. They can change the whole body with a few 100’s of Euros worth of investment and in about 1 day. That’s how fast it is. Cool.. a car of 100 MPG??? OMG!! I can never believe this. Is he really working on a project of 5-star equivalent rating and 1.25ltr/100km? I think what Wikispeed are doing is awesome. They are trying to change the world by using lean, agile and scrum methods. I really never thought that agile, or scrum could be successfully used in building cars. All I know is that, it takes years for automobile manufacturers to build and design cars and could cost a lot of money. It surprised me on how successfully Wikispeed evolved from their original model to the latest one. They had a goal to make a car of 100 mpg, and took the “GEFN” approach (good enough for now). They rapidly kept improving their models and at the same time lowered the cost by having the right people and tools.